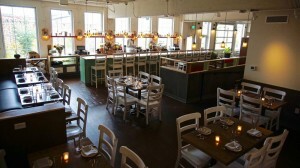 Brasserie V opened in 2007 and expanded its space on Monroe Street in 2013. Although there was not a table available to accommodate us when we arrived, we were offered the option of sitting at the bar or window seats, where the full menu is available. We took this option, but before our drinks arrived the hostess let us know that a table had opened up and we could move if we desired, which we did. 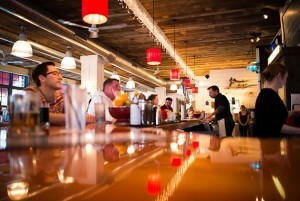 Julep is one of several small restaurants and bars clustered within one address on an up-and-coming section of East Washington Avenue not far from the capital. Entering from the street, Julep is at the end of the space, and it opens up nicely with a clean and pleasantly lit area with a long bar designed to reflect the Southern focus of the establishment. An outdoor patio, part of the larger Robinia Courtyard, completes the place, and is the preferred seating during warmer months. Acoustic acts play on certain evenings with the events reflected on the Julep Facebook page. Gates & Brovi is located on the corner of Monroe Street and Glenway Avenue, at the western end of the Monroe Street Strip and just down the hill from the Glenway Golf Course. The casual establishment is self-described by restaurateurs Phillip Hurley and John Gadau as “East Coast fish house meets Midwest supper club,” and that’s a fairly accurate description. While live music is not a part of the equation, this writer swears he saw members of V05 there, though it is difficult to verify without the bell bottoms and big hair. But, let’s get to the food. While there is more than fish at this fish house, it’s the seafood that really stand out. Clam Chowder is always on, and it’s some of the best you’ll find in Madison. For appetizers, both the fried smelt and fried calamari are a cut above what you’ll generally encounter, and the shrimp cakes are hard to pass up. Gates and Brovi has a wide selection of sandwiches and burgers, but it is the fish again that stands out with the bluegill sandwich and shrimp po’ boy both topping the other options. The fresh cut salmon burger gets an honorable mention. The burgers are good, but hamburgers are everywhere, so why bother? Before the Tip Top Tavern reopened two years ago this month, it was not all that friendly. If you were looking for trouble, the Tip Top was a prime place on the Northeast side of Madison to get it. Today, above the corner-set front door, a neon sign reads “for every true lover of life,” and now the ambiance inside reflects that. We’ll get to the food, but the environs of the new Tip Top is the place to start. It is decidedly positive. The vintage vibe of the old tavern has been retained while the bartenders and wait staff are generally engaging. Vinyl records often spin on a turntable behind the bar, and the single large television is usually set to a classic movie channel with the sound turned off. Weekend evenings sometimes offer live music (see the Max Ink calendar), and out back, there is a large patio area with full wait service. Owner Ben Altschul has done a great job of maximizing the favorable attributes of this classic property. Kirby Nelson isn’t the kind of man who minces words. “I’m 59 years old”, he says, “and when you’re starting a new company at this stage, it’s kind of scary. But beer is never boring and I’m having the time of my life.” Nelson is the brewmaster at Wisconsin Brewing Company, an upstart (albeit well-funded) brewery based in Verona started by former Capital Brewery president Carl Nolen, his Mark, and Nelson, himself, Capital’s brewmaster for over two decades. 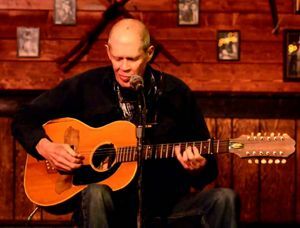 Taking up the mantle of music on Madison’s far east side, The Knucle Down Saloon took over from the old Area 51 bar and then became one of the city’s hubs for Blues music (along with other genres). 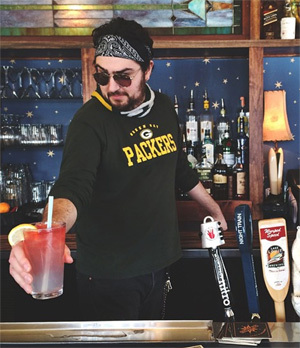 Chris Kalmbach was a veteran of working in the bar business and wanted to set up his own shop in Madison. When the club known as Area 51 on Seiferth Road became available, he jumped on it and The Knuckle Down was born. Local scenes develop around locations. In Madison, the current hub of live music is downtown and the near East side (Willy Street, East Wash, etc…) But what about the people that don’t go to those bars? While Middleton offers several clubs with local talent, the far West Side offers little in original music, and until Funk’s Pub, Fitchburg has been especially dry since The Bean (get it?) went out of business a few years back. Enter Max Dvorak, a singer/songwriter, and David Montesinos, an music producer, Madison rock veteran, and studio owner, who were looking to put on great shows in a different part of the city, realizing that there’s a population of people who were under-served outside of downtown. Together they created True Music Promotions, who hold events in True Coffee Roasters on Nesbitt Road in Fitchburg. Cold Fusion. It’s a cool science fiction-y sounding name for a venue in Middleton that’s doing their best to put on a new face. 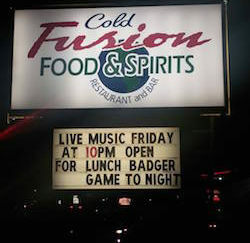 While Middleton only has a handful of live music venues, they tend to last longer than the ones in their larger neighbor, Madison. Probably because they don’t tie their entire fortunes to live music and downtown landlords can put the squeeze on small businesses when there’s a chain just around the corner looking for a foothold (how often do you see live music on State Street?) The Branch Street Retreat was around forever. I was friends with the last owners and they did their best to make it a family-friendly neighborhood bar, almost like an Up North supper club. The keys have passed again, though, and this time they’re going for something completely different.